It took me ages to get into fantasy books. For most of my life, I had no interest. I didn't want to read about some made-up place that never existed and people running around with swords and elves and trolls and dragons and whatnot. I wanted stories set in reality, in the modern day. Fantasy films were fine, but I only had to spend two hours watching those. Reading a fantasy book was altogether different. I never read The Lord Of The Rings. My brother did, and whenever he spoke about it I could sense the frustration in his voice whenever he talked about the endless songs and silliness. I liked the movies, of course. Well, I liked the parts in the movies where they focussed on the humans. Hobbits I could do without. And then I read a review of a book called The Blade Itself by Joe Abercrombie. The review said this book had blistering action and fascinating characters and the whole thing was held together by acerbic wit. And that was the thing. Wit. Humour. For me, fantasy books just seemed so incredibly po-faced, like they took themselves way too seriously. So I picked up The Blade Itself, and I loved it. I loved everything about it. I loved every single thing about this book and it was fantasy, so I asked myself— what else have I been missing out on? And the series that was recommended by quite simply everyone was George RR Martin's A Song of Fire and Ice— which later became known as the Game of Thrones books, thanks to the TV show. So I read that, and I loved it. I read the next one and the next one and the next one. I loved them all. 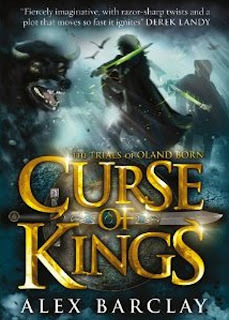 All this is a (very) roundabout way of introducing Curse of Kings, by Alex Barclay. Alex is a friend of mine. She's a crime writer by day, and has recently become a fantasy author by night. I love her crime novels. I never know what the hell is going on until the final few pages, and I am technically in love with her main character, Ren Bryce. Ren Bryce is the most awesome woman in the world, and I don't care that she doesn't actually exist. She exists for me, and that's what matters. Alex's crime novels are thoroughly modern and laced with one-liners and sarcastic asides, so when she told me she was writing a fantasy novel for younger readers, I was thrilled. Yes. There are things THAT disgusting in real life. I'm not going to go into detail about the Big Mystery in Curse of Kings, because even mentioning what the mystery hinges on could spoil it for you, and I wouldn't want to do that. Hopefully it'll take you as much by surprise as it did me. And if all that doesn't convince you, take a look at one of the coolest book trailers I've seen in a long time. And pay attention to the man whose quote they use on the cover. He sounds like he knows what he's talking about. Alex Barclay? I believe I've heard of him. Most Bloglandians are chatting about him. I heard his name at the local blog ball last year! OOps! Googl'ed him. Its apparently a her. Oh, how I've been awaiting a new post from Thy Golden God. AND HE NEVER STOPS MAKING ME HAPPY! I will most defiantly read this awesome book! You know, I think I might just do a blog post on this derek! DEREK THERES A FIRE WHERE MY MINION FRIENDS LIVE!!! Well, I'll certainly go hunting my local library for those...but like everything else I want to read, any books anyone ever mentions to be good that I want to read especially, it won't be there when I need it. ZAF!!! I hope your minion friends will be okay...they probably will be...just have faith and stuff...it's worked for me loads of times! What kind of fire? How big? OH!!! They used Derek's quote!! Derek come on and say hi? DEREKq IM GONNA SEE YOU IN GALWAY! Here's the thing. I'm me and me is unlucky, so Derek will come on and say hi when I've gone to bed. You got a Christmas card from him? Omg! ...I want a Lamprey Eel...it shall be my familiar, and as I am Nemone Debonair-Penguin (can't be bothered to change screen name) so it shall be Nemo/Marlin/Coral Suave-Puffin! I am 100% done with you, my man. P.S COULD YOU POSSIBLY GO ON BEBO YA'LL HAVEN'T BEEN ON IN AGES. It's driving us all insane-er...er...(Insanerer? ), AND I'M NOT SURE YOU'LL COME OUT ALIVE IF OUR SANITY LEAVES US ANY MORE. I'm putting the quote 'Doors are for people with no imagination' in next to my name in my year book...we're allowed 20 words, you see. I think I might read that book Derek! Only because YOU recommend it! Also HI DEREK!! GET ON TWITTER!! You are sorely missed on there!! Also did I say Hi?! Oh, well, I'll say it again anyway HI DEREK!! I'll have to look into it, Derek! I'm almost certain Amanda and I will be coming March 28th. Almost. Well, probably. But DEFINITELY sometime between March 28th through April 7th. And one of those days/nights we'll be in London. Just to give you a heads up! I'm English...I think that's a win for me? I'm American, but I'm going to Ireland. HI DEREK. I SHALL BE MEETING YOU SOON. ...welp, it's 11 now. I'm off to bed. Before I go: Where on the HarperCollins site?! Talk me through it step by step or something! But I got REALLY lucky that Amanda can come. I know it wasn't exactly the point of the post but I've just tried a sample of The Blade Itself and I think I already love it. 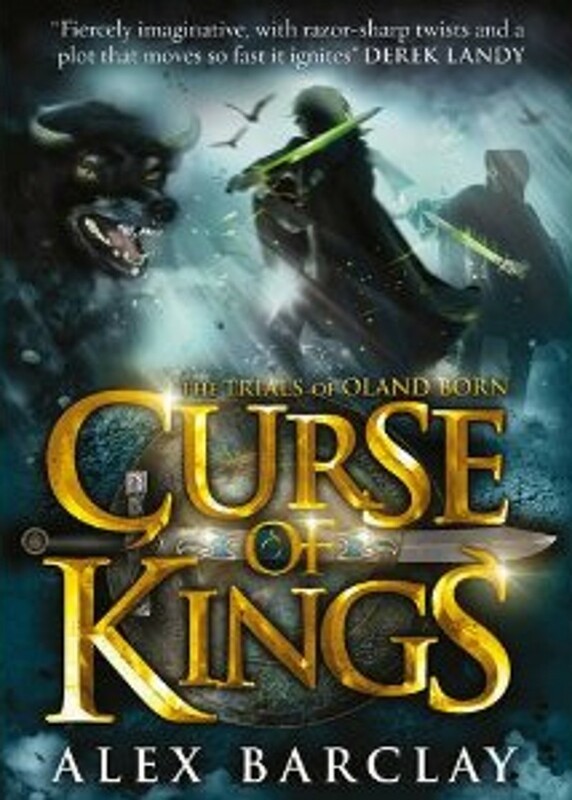 Thanks for the recommendation - I will try Curse of Kings but I'm already invested in Logen. And it's the first of a few books which is lovely, nothing beats have a really good series ahead of you (I discovered you and SP only three months ago). Also, fantasy, Eragon was the first long book I really loved so yes, I like the fantasy stuff. I haven't actually read the LOTR, though, but I've read a few fantasy novels. They're kind of hit or miss, in my opinion, and I'm realizing I'm a bit of a futuristic earth kind of gal. Unfortunately, it seems all that world is becoming that so I'm not... all THAT original. And Derek won't go to America so..... Hmm what if I go off in an email to them? I better go get ready for school. Er, shame I have to go in ten minutes. I might've gone all the way to two-hundred otherwise. For the fun of it. I wonder if Minnie remembers me. I REFUSE TO ANSWER THAT QUESTION ON THE GROUNDS I DO NOT KNOW THE ANSWER! That was said by somebody. I will give you bowls of lollipops and confetti and bid thee FAREWELL! Okay what do you call a place where you would park your car? lamprey eels are disgusting and...interesting (i guess) at the same time. i'm the exact same when it comes to fantasy. and, dear god, tell me those eel/leech hybrids are not real. Knows what he's talking about?! I think next time they should used YOU. We're still on the first page!!! I'll be sure to check it out, Derek! Promise! ... Maybe! Uh... Yeah! Will be here in 20 minutes or so... Maybe. Hi! I'm back but distant! And lunch might be ready soon! Hi Ally! We're all crazy here! I just watched Cats. And I want to play Jemima. Right. Now. And we have a kitten here who looks like Mastofalies(I'm pretty sure that's NOT how you spell it...)! But it's black with a white spot on it's front and white paws. And it's fur is so soft! Then again, it could be worse. Sev, if you haven't already, don't read my Eff/Fabi MC chapter. I'm stuck at the dance studio. I used to help out in a younger class at this hour, but they canceled the class, and only told the people who were in it, not me. Thanks. What about the font? Does it look different? I forget the Beauty and the Beast musical... I watched it once, but it was a while ago. It started cursivey, but changed back as it finished loading. Lav, I saw it on Tuesday, so I am newly obsessed. It could be worse. There could be a tap class upstairs. Oh, it's just really inexperienced ballerinas. The nine-year-olds are louder than the teenagers. I tried ballet once... By once, I mean for a day... :P I just wanted to try it out. But I took tap dance around that time. I'm not a giver-upper. I'm not really a try-everything person either. Did the Beauty and the beast musical you watched have the song 'A Change in Me', Sev? I've been doing acting stuff since fourth or fifth grade. I auditioned to be a Munchkin in 3rd but I didn't get in. I play basketball for fun sometimes. I guess I'm okay, but not great. And I don't usually play. I just like to practice my shooting. Martial arts. And piano. My dad actually stopped taking me to the martial arts classes... For no reason. There's a boy in my grade. He played Peter, but he's a terrible actor. He's always talking about how martial art-y he is. And then on opening night he punched me in the nose. And instead of apologizing, he said it was self defense. I love into the woods! My choir class used some songs from that play(and A Change in Me), and I got to be Little Red! I take drama, too. Not as much as dance, but a bit. Have you heard of the musical called Once on this Island? Lav, yeah I've heard of it. Look it up. It's pretty good. I did a solo in a choir recital at school using a song from that. Guess I'm going too. Bye Blogland! I'm not the ultimate fan!!! D: I didn't read all the books! The contest prize is that ten winners get their name in the dedication of the next book... The ultimate Warriors guide... But I'm not the ultimate fan!!! I bet there are people who've done crazy fan things... WWWHHHAAAA!!! No fair!!! Lav, you could mention being in South Korea... Do they sell the books there, or do you have to get them long-distance? The latter could be a point in your favor. Beans! XP did you get that from the Borrowers? Weeelll... It's only for US people... So I was thinking I could just give my home information when I do it... Not being in a different country. Well, actually, they DO sell some of them here. In English. But I think it's cheaper as an ebook. It's okay. The contest is pretty long, so I might have enough time to read the rest and be able to say that I did. It ends in April. Ok. Good luck with it! Sorry. I gotta go now. Bye! I'm still here, distantly... Until I say I'm not, or until 7:00-ish in Blogtime. Never mind. Dance practice was moved to a little later. So here now! I like behind-the-scenes tours... So much inspiration for writing! Behind the scenes as in the extras in movies? Did you know that the Burke Museum actually has an Egyptian mummy? And [whispers conspiratorially] those aren't even it's real feet! Ohh. I've never been to a museum before... Except in Korea, but it's probably really different. Wow sorry that was a poor introduction. You can all ignore that if you want. So how are all you lovely people today? Hi Aretha! Why so tired? No way! Nowaynowaynowaynowaynoway! No. Way! The wife of the author of my favorite comic(Amulet, by Kazu Kibuishi) has a blog!!! And it's a book blog like Dublin Daes! I am soo going to follow her! Or maybe I'll just follow... And read later. Hope you feel better, Ari. Congrats on your find, Lav! Hmm... How much should Eff destroy? Thank you, though, Lav. And that's really cool about the book blog! Fabi- do make sure you get silence repaired. I need it for dramatic purposes in a good number of stories. By procrastinating, I mean talking too much on here... Not that I CAN'T do both at the same time but... I get distracted by talking. Not anyone's fault but mine. Just thought I'd say. And yes, you should be sleeping. Hope you can get a break soon. And catch up on sleep. Who's a good historical figure to associate with a fictionally infamous gemstone? Um... I'm not really sure yet... I don't WANT to, but I might HAVE to... If at all, it will be around the 22nd... Or sooner. Depends on what comes first. Or I could be totally wrong and still be able to come on after the 22nd... Unless I move back to my old room... The one I stayed in with my mom's friend(she's also my friend's mom... Our families are pretty close, relation wise), who is like my guardian/aunt... She sort of banned me from talking on here... Which is why I haven't been on much until now. Cause I moved rooms. A supposedly cursed one, that actually has a magical amulet stuck inside it. Somebody noble/royal, and possibly slightly evil. Um... maybe I should go.. Bye.